Where is the DTO 4? Last month I presented a 2008 map of downtown and asked for input on the locations of the districts that constitute downtown. The comments revealed areas of agreement and contest. The map below hopes to illuminate the areas of contention so we can achieve new consensus. The neighborhood lines are removed because they weren’t contested except at the margins. So what are the areas of disagreement? I don’t like the term Midtown because, as Artemis said, downtown is not big enough to have an Uptown and a Midtown, and the terms also imply that downtown is a separate area from Uptown and Midtown, when in fact they are subdistricts of a larger downtown. Oaksterdam, though present in the popular imagination, is not a clear-cut district – the University is on Broadway between 17th and 15th, and there are several Oaksterdam University-affiliated storefronts on 15th Street, but the area is at best three blocks large and therefore too small to be a downtown district. Personally I think of Oaksterdam as less a place than a state of mind. Nobody likes SOBO, but what other term should be used? By the way, the Downtown Association seems to want to extend City Center across Broadway, via 13th St.
Nobody seems to like either of these names. Civic Center is the historic name for the area although grand plans for a County and City hub collapsed after the passage of Prop 13. People often refer to things in this area as “near Laney College,” but Laney College itself seems too specific to be the name of a neighborhood. So what should it be called? Is it just a subset of Chinatown? To me it seems large and distinct enough to be its own district. West DTO is a term that I coined to describe the western edge of downtown that borders West Oakland. Like its neighboring ‘hood, Ghost Town, the West DTO is underpopulated and underdeveloped. However it’s pretty big, and is clearly separated from City Center / Old Oakland by 14th and Clay Streets. Does this area need a name, or should it just wait its turn for investment? Is it perhaps part of Uptown? Folks didn’t seem to like Lake Merritt Office District, which is more-or-less the official name for the district that’s home to Oakland’s biggest private-sector office buildings. Lake Merritt Financial District, another traditional name for this area, seems pretty dated given that Oakland lost its financial industry (which was indeed headquartered here) quite some time ago. A part of our discussion not covered here is the creeping border of downtown, with Uptown being used to describe restaurants and bars as far north of 27th Street. If you’re interested in the future of Auto Row, plan to attend the relaunch of the Broadway / Valdez Specific Plan next Thursday, April 28, at the First Presbyterian Church at 2619 Broadway, from 6 to 8. You can learn how the City is planning to transform Auto Row into a retail destination and high-density housing. (1) Oaksterdam – If you don’t want to include Oaksterdam, I’d say that area is part of Downtown. I wouldn’t rule it out based on size, as it’s about the same size as City Center, but I can understand leaving it out based on vague boundaries amd state of mind vs. place. I agree the area isn’t big enough for a Midtown. (2) Civic Center – I don’t have a problem with Civic Center — it fits. 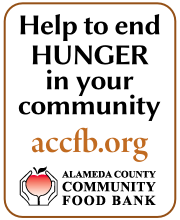 It contains the OMCA, the library, the courthouse, and the Alameda County offices. Definitely not a subset of Chinatown. (3) West DTO – I guess you don’t like San Pablo Gateway It might want to be part of all the activity in Uptown, but it seems its own neighborhood to me. (4) Finacial District – No strong opinions on this one. Shouldn’t name, like form, follow funtion in some fashion? Old Oakland and Chinatown are good examples of place names that reflect what’s there. 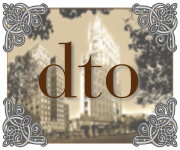 DTO continues to mean nothing to me, and SOBO?. I have no idea what that even might mean. West DTO is only a block from regular DTO. How about East DTO? Won’t they feel left out? Lakeshore Residential is a description, not a place name. No one has mentioned the potential for Kaiserville, considering the massive expansion of that healthcare giant in the upper reaches of DTO. I kind of like it. The whole area surrounding B’Way and MacArthur and sliding down into the old Auto Row. Kaiserville! If the B’Way corridor is going to be a retail strip it needs one name that unites it, not three names to divide it into little six block districts. Uptown, despite its generally vague perimeters, has a groing identity brought about by the new condos and all the hipsters and upscale couples therein, and the requisit nightlife that has followed. Thank Jerry and his myopia for delivering something besides frustration in the rest of the neighborhoods. Maybe it’s just too early to set the names of all these subsections. A few more years of investment will reveal the character of central Oakland and that character will reveal its true name. Remember, Kaiserville, Kaiser City, Healthcare Hamlet, Malpractice Meadow, Busted Knee Junction. You heard them all here first and I want coining credit! Way too many “neighborhood” names for a very small area. There are some natural dividing lines downtown, but most of them – including Broadway – are wide and flexible, with a block or three of maybe-this-maybe-that on either side. (I’d say freeways and water are the only fixed boundaries.) When you start whacking an 8 or 9-block stretch of downtown into 4 separate “neighborhoods”, you’ve left logic and natural neighborhood definition behind. Dump West DTO, FiDi (which is just awful and sounds like Diane Feinstein backwards anyway), SoBo (also awful), Oaksterdam, “Residential” from Lakeside, and Civic Center. That leaves City Center, Lakeside, Uptown, Old Oakland, and Chinatown, all of them more or less comprehensible as neighborhoods with different identities, but each one with one or more imprecise borders – which lets nature take its course. I know I’m not addressing the near-Laney-College quandary, but frankly just calling it Near Laney College would allow a more organic evolution of identity than trying to make it Civic Center. It has a vague indeterminate name because it’s a vague, indeterminate area. If I see a place called “Civic Center” on the map, I would expect to see one when I get there. Lake Merritt BART and the blank walls of OMCA don’t really do that. I agree mostly with Don. The idea of creating area names every 4 blocks makes no damn sense. WDTO – no; why not East West Oakland? neither name makes any sense. 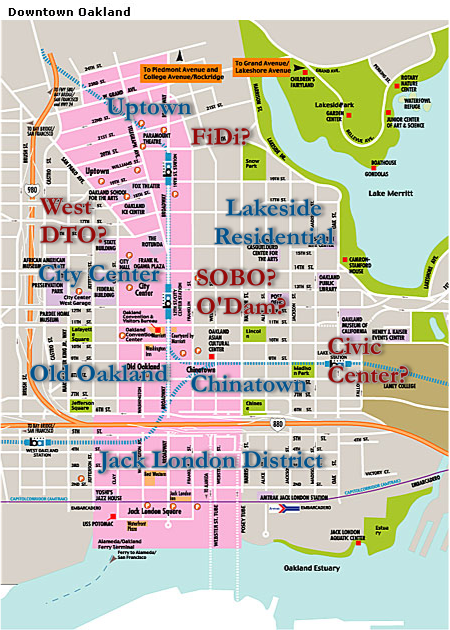 City Center and Old Oakland are technically WDTO. And the area is much geo closer to Uptown. Either Upper DTO, which I really don’t like because of the potential for confusion with Uptown, or San Pablo Gateway. Waiting until future development is not bad either. My guess, though, is future development here is going to be similar to Uptown development so why not extend the Uptown boundary. SOBO and O’Dam: hell to the no. SOBO if it is what I think it is will be the most confusing name in the lot. First people tend to think of B-way as N/S (North Broadway). Second, if you were to stand above the BART station and look beyond City Center, you are looking into West Oakland. It is bad enough that most people can not read a BART station map. This clearly will not help. Third, if it is what I think it is, the street is BRoadway, not BOardway. O’Dam is just a non-starter. Frankly, I just assume expand City Center to the lake and include the CH, Library, etc. It makes no sense to have a city center that occupies just a few block by City Hall. It also solves, in part, the “Is there a midtown?” problem. Well, at least until someone realizes that downtown is so subdivided that downtown does not really exist. Civic Center – no. See above. It is bad enough that BART Operators will roll into City Center and mistakenly announce Civic Center but to have an area that has the same name as a big area of SF is asking for confusion. One could make the 2 Chinatown argument but to be honest when people think Chinatown, they mostly think SF Chinatown. Besides Chinatown is like a franchise. FiDi – ain’t no finance going on here. Right now it is probably best called Kaiserville. I suggest we move cautiously. We have managed this long without a name, I am sure we can manage a few more years. Near Laney College – puhlease. Take that weak sauce home. Lakeside Res – seems to include a number of commercial bldgs. Ralph, financial institutions are in fact the predominate business in the area labeled FiDi, so that is the appropriate designation. When I think FiDi, I think banks/money centers with headquarters at the very least large regional centers. I am not thinking branches, insurance offices, and advisors, which is really all the finance happening in that neck of the woods. Thus FiDi is not the appropriate designation. The naming is to me an attempt to give the city an identity much like one would find in SF, NYC, DC, Balto, Boston etc but stealing FiDi from its better known SF counterpart shows a lack of creativity and originality. The idea should be to create an Oakland identity not latch onto SF. Thanks for starting this discussion DTO, it is fascinating for urban nomenclature geeks like me. Your argument against a Midtown would also be an argument against Uptown. Don and Ralph make interesting points regarding the area sizes, but I think there might be room for finer grains. For example, to someone in San Francisco, I might say I live in Temescal, to an Oaklander I would say East Lorin, and to someone living in North Oakland, I might even say Poirer, which is a name I coined to be able to refer to my micro-neighborhood. I like the idea of expanding City Center across Broadway. In general, I’ve always thought it a little odd for commercial high streets to define neighborhoods edges since both sides come together at them. Clearly it happens though, witness Old Oakland and Chinatown, maybe it is different with downtown districts. Perhaps City Center expands east to Harrison and north to 17th? This would help ameliorate the Rousian festival-marketplaceyness of the term City Center, and obviate the need for SOBO, O’dam (state of mind…love it! ), or Midtown, which are all terrible in their own way. I like Civic Center, and think it should include Laney College, which seems to me a nominally civic use. Gene is right, there are a number of Alameda County administrative buildings here, OMCA, the main library, the post office, BART and MTC operations – seems about perfect to me. All we need to do is tear down that horrid cylindrical parking garage for the headquarters of the regional governing body we so desperately need. West DTO seems forced to me. I think I’d go with City Center below 16th and Uptown above. Though perhaps we should move Uptown above Grand Avenue to 27th Street, and call this whole area Midtown? If for no other reason than to punish Uptown Apartments for their historicist architecture and that stupid suburban row of plantings between the buildings and sidewalks. I think FiDi could work, and I’m not concerned in the least by sharing names like FiDi and Chinatown with other places. It seems to me many places share some names, and have others that are unique. That said, I much prefer the more generalized Lakeside that would refer to both this area and the residential area to the south. Oakland Shines refers to this area as the Gold Coast, which seems appropriate given Kaiser, the Oakland Cathedral, all that (tertiary) finance, and those gracious old apartment buildings. But I think I prefer Lakeside, it seems more local and unique. Finally, why Jack London District and not Square? I’ve seen Ironworks District and Warehouse District, flanking JLS to the west and east respectively. I kind of like those, though I’m not sure Ironworks would fall under the DTO, since it would probably start west of MLK. So I guess I’d go with Don’s five (City Center, Old Oakland, Chinatown, Uptown, and Lakeside) and add Civic Center and Jack London Square. Sorry for the long comment, I probably should have just responded on my blog, but I was too lazy to make a new map. Admittedly the size of downtown, makes Uptown sound strange but it feels right. And to be clear, it is not that I oppose double dipping on names, the issue is trying to create neighborhood identities. Gold Coast and Lakeside are districts in a number of cities and I have no problem with using them as they are not associated with well-known SF districts. But Oakland has been the long suffering red headed stepchild in the bay area. While Chinatown has been long established, I think reusing FiDi creates an easy oppty for people to take cheap shots at Oakland. Thinking about it, I would say City Center is really midtown equivalent. Possible to call this area Government Center. Lakeside is a good name. Can someone explain to me the origin of Gold Coast. I don’t see it in the neighborhood. Ralph, I see your point on FiDi, but we should definitely keep Chinatown. It is common in larger cities, and ours is better. I saw Gold Coast at Oakland Shines while doing some basic research for my comment. I don’t love it, but I think it makes sense. Government Center is way too clunky and it is basically synonymous with Civic Center. How is City Center a Midtown equivalent? I agree with Ralph on the SOBO tag (besides despising it on principle; “SOMA” still grates on my nerves and always will) – I’m mostly a north Oaklander, and the spiderweb of non-parallel, kind-of north-south arterials (San Pablo, Adeline, Market and MLK, Telegraph, B’way, Piedmont) has forced me to pick one that’s “north”. I picked Broadway even though real north is somewhere between Telegraph and San Pablo (I think). There will never be a “south of Broadway” that makes any sense in my mental map, and SOBO will never be an abbreviation for SOuth (of) B(r)Oadway in my spelling map, either. I also agree with Ralph that “Near Laney College” is weak sauce – that’s my point. It’s a lame designation (not up to “name”, exactly) for a place with no identity. Places with no identity don’t get names. They evolve into them or not, and pushing the process results in fakeries based on promotional hope, not real life. For me it’ll stay “over there near Laney” until another name soaks into my mind through actual usage from people close enough to it to listen as they create a neighborhood, hear its new name, and pass it on to me.